When we were growing up, I would sit at the computer for hours in the summertime, writing away with the effortless ease of a twelve-year old who had yet to know an editor’s rejection. My sister would periodically come in and ask me to read to her what I’d written. She’d sit behind me on the piano bench and listen. My sister’s encouragement was key. I wanted to write more because she wanted to hear more. Now, deep into my thirties, that dynamic has returned. She doesn’t sit on the piano bench to listen anymore—mostly because we living on opposite coasts and I don’t have a piano—but also because I’m now much too precious about my work to share it with anyone before I’m absolutely ready to do so. Yet, it feels good to be back in my old seat. Years ago, I abandoned fiction writing because I abandoned every project I started. I figured I just wasn’t cut out for fiction. I wrote two non-fiction books and was planning on a third, when I decided to work on this one for a while. At first, it was exhilarating. It was not me simply creating a world on the page. It were as though I was chipping away blankness from a story already in there. But after all the chipping of the first draft was done, I had a mangled, wild beast of a manuscript that made very little sense to anyone except the voices in my own head. This second trip through the draft is a bit like tracing the steps of a sadly deranged missing person, piecing together the clues they tried to leave as to their whereabouts with moderate success. I know it’s a weird book. And it’s getting weirder. My morning ritual involves getting up at 5 am and fighting the perfectly reasonable reasons as to why I should go back to bed. I don’t have anything to say. This novel is too messy. If I’m going to write, I should write something I know will sell and will bring in some income as opposed to simply draining my sleep and my time with Mr. Husband. I push through the fatigue and the “not gonna work” voices and settle in at my computer. Recently, I’ve only been able to chip away at three or four paragraphs per day. It’s not perfectionism holding me back. I’ve slayed that dragon many years ago. It’s listening. I sit with a sentence and I go into the story and I ask the characters if that’s what they really meant. What really happened? I ask them, as though I’m a technician in Westworld asking the hosts—my characters—to “switch to analysis” so they can tell me what’s going on with them. Sometimes they do. Sometimes, I just stare at the page, waiting for the words to materialize on their own. I’ll routinely resent Stephen King for his indefatigable production engine, JK Rowling for having all the brilliant ideas, and Neil Gaiman for having a finger on the pulse of that mysterious and beautiful wellspring that spills out his stories. I am thankful for George RR Martin because he understands me (no, we’ve never met…no, he doesn’t follow me on Twitter, but he understands me even if he doesn’t know I exist). He writes maybe a page or so a day. That’s his pace. I can’t imagine the pressure: millions of people tapping their feet, waiting anxiously for his next book. The only person tapping a foot for mine is my sister and I can handle that. She’s not millions of tweeters or bloggers pushing for my manuscript to be done, as Martin must contend with. I’m also lucky to have my relationship with Tarot, which can be a true friend in a challenging writing period. Dear Tarot, why is this second draft taking so long? 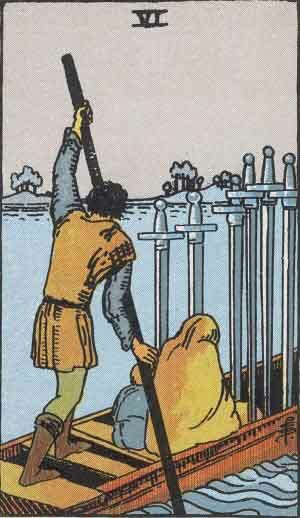 6 of Swords. Not a great card, but certainly an understandable one. The tired, cold little family crossing a thick river in a tiny skiff—it’s simply a long and arduous journey and I’m doing the best I can. But the good news in the card, which I hope is good news for my novel, is that the shore is in sight. Maybe the shore is in sight for me, too. Tarot, is there something I should be doing differently to improve (but not necessarily rush) the process? 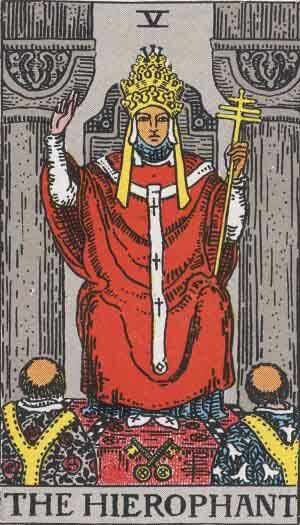 The Hierophant rests more on logic and structure than emotion. It’s possible I could be more organized in my approach to the novel, focusing more on the technical pieces of it rather than the emotion. Emotion ruled the first draft! Logic might need to rule the second. 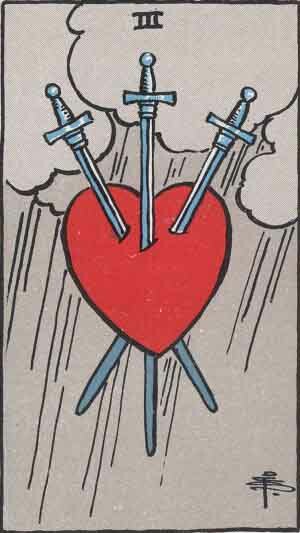 The 7 of Swords: I associate this card with organized chaos. To the outside world, the little character in the card might seem overwhelmed, but they are smiling. In fact, they’re looking over their shoulder at the two swords left behind as though they think they could pick them up and carry them along if needed. The 3 of Swords: Maybe it’s a little heavy-handed? I did put a lot of some of the grief I suffered through losses in my younger life. Maybe I can take that down a peg? 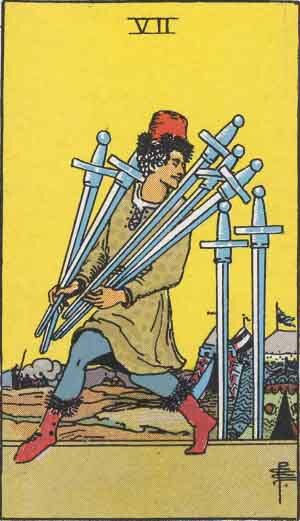 Then again, I’ve also seen the 3 of Swords to mean “suffering over suffering.” I have driven myself a little crazy with this novel. Maybe I am what is not working in it. But also, it being the 3 of Swords gives me a little comfort that perhaps I can take care of the final few things that don’t work in the third draft. I’ve got plenty on my editing plate at the moment! One final card! Is there anything else I need to know about the writing of this novel? 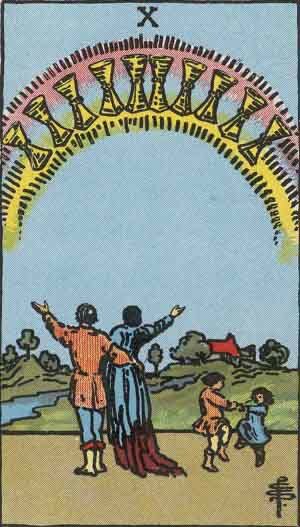 This 10 of Cups is a triumphant conclusion card. No matter how many sword cards are bogging me down in the midst of the process, the end product is coming and it’s going to make me very happy. Hopefully it will bring in lots of money, as that will make my husband happy, too! For now, it’s one sentence at a time. Those sentences become paragraphs, which become pages. Eventually, the pages become chapters and then books. That happened with my first two. I’m sure it will happen with this one, too. Courtney Weber is a Priestess, author, Tarot advisor, and activist. 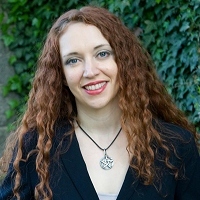 She is the author of the newly released Tarot for One: The Art of Reading for Yourself and Brigid: History, Mystery, and Magick of the Celtic Goddess (Both through Weiser Books). She produced and designed “Tarot of the Boroughs,” a contemporary photographic Tarot deck set in New York City. She blogs at Huffington Post and on her website: www.thecocowitch.com. She lives in Manhattan with her husband and cats.